"Aren't you afraid of Giuliano? You know what they call him, don't you? 'The Lord of the Mountains.' Sicily is mostly mountains..."
As much as we love Sicily's seductive beaches and stunning coasts, our passion for the mountains is something of far greater emotional complexity - something bordering on the mystical. The simple fact is that most Sicilians are either sun-worshipping 'beach people' or hardy 'mountain people.' Adherents of each group show the courage of their convictions. There's really no compromising, no in-between, because it's a simple question of where you'd spend your vacation if you had a good choice. Yes, Sicily has some flat areas, especially the coastal plains around Marsala and Catania, and the gently rolling hills of her wine country, but the duchess in The Sicilian was right: it's mostly mountains. That's where you'll find many of our island's ancient treasures and most of the medieval ones. Hilltop castles are the norm and a few (like the one shown here) are built right into the limestone. They are literally part of the rocky landscape. 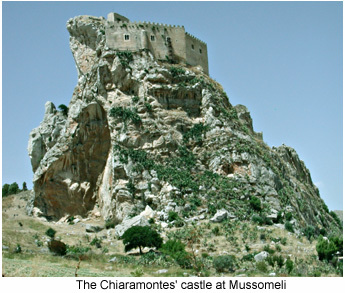 Some castles - like Castelmola above Taormina - overlook the sea from on high while others are isolated in the rugged interior. When most of us think of Sicilian mountains, it is Mount Etna, the highest, that first comes to mind. Indeed, this large volcanic mountain dominates the eastern third of Sicily and is visible from as far west as Enna. It is not, however, the only volcano of Sicily, even if it's the only one on Sicily. There are several in the Aeolian Islands. Sicily has three principal mountain chains (as shown on our map), plus Mount Etna, which is much younger - though still too old geologically for any human ever born to remember the volcano's birth. Etna's upper slopes are covered with snow for three or four months of the year, and it is these snows that feed streams like the one that formed the Alcantara Gorge. The wooded regions are a wonderland of wildlife, but the Nebrodi Mountains, to the volcano's immediate north, are a well-kept Sicilian secret full of forests, streams and rare creatures. 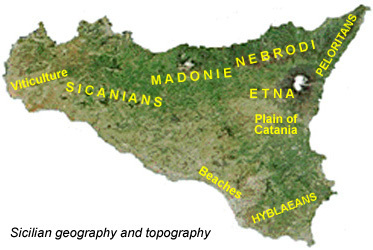 The Peloritans are a small chain straddling Cape Peloro to the north of Messina. Steep but not very high, they form the interesting backdrop you see when arriving at Messina by sea. If you travel westward toward Palermo beyond the Nebrodi region you'll reach the Madonie Mountains. This chain is not quite as high or as green as the Nebrodies which segue into them in the east, but in the Madonie region you'll encounter endangered flora such as Sicily's rare Sicilian Fir and the manna ash. A vast part of west-central Sicily is covered by an irregular range called the Sicanian Mountains associated with, among other things, the myth of Icarus. Though greatly deforested, the region has a few woods. It was once Britain's primary source of sulphur. Then there are the Hyblaean Mountains, which Italians call the Iblei, in southeastern Sicily around Ragusa, Noto, Lentini and Vizzini. Here are the necropoli of Pantalica and the canyon of Cavagrande Cassibile. Sicily has a number of nature reserves. Some, such as the Zingaro, are in mountainous areas but are not part of a chain known by a specific name. With the exception of Etna and the mountains of the volcanic Aeolians, all of Sicily's mountains were formed as part of the Apennines which reach across the island as a geological bridge between peninsular Italy and Tunisia.